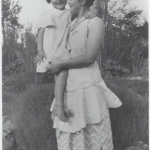 Posted in 52 Ancestors Challenge on February 19, 2014 by Amy Johnson Crow. 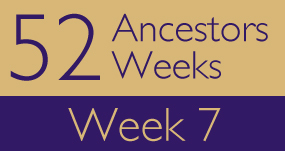 It’s hard to believe that we’re already at Week 7. I would like to apologize to those whose posts I missed last week. It’s no excuse, but I had a hard time keeping up while I was at RootsTech. Hopefully I have them all this week. FOLLETT – “Charles Follett” by Joanne Clyde on Do You Know the Muffin Man? GATLIN – “William Dow Gatlin, Ax Murderer” by Beth Gatlin on So Many Ancestors! GOSLING – “James Foulds Gosling” by Kirsty Gray on Family Wise Ltd.
GRAHAM – “Joseph A. Graham, Sr., Hotel Steward and Union Organizer” by Tim G. on Photo Restorations by Tim G.
JOLLETT – “Lurenna Jollett Bryan” by Wendy on Jollett Etc. MARSHALL – “‘Boxo’ Marshall Goes to College, the Seminary, and to War” on Who Were They? RENFRO – “John Stephen Renfro” by Daniel Sample on Where Were They Then? TREADGOLD – “Dr. Herbert Alban Treadgold, M.D. [C3R]” by Kale Liam Hobbes on Your Roots Are Showing! Thanks, Amy! we appreciate this so much. Mine isn’t in the list, but I got it in early Tuesday morning – I think! Not sure why I didn’t see it, but I’ll list it in next week’s recap. This is fantastic Amy- thank you for posting everyone’s link, especially by surname…I haven’t found any connections yet..but I keep coming round to check..just in case! You’re welcome! There have been some bloggers who have made connections with cousins (sometimes with other bloggers! ), so keep checking! Agreed – now to find the time to read them all. Each one is rich with detail – a storyteller’s paradise. Just wanted to let you know that I’ve posted a new blog in Skeletons In The Closet called Mary Was A Madam. Thanks for letting me know! 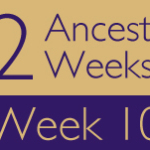 If you want to make it easy on yourself, just include “52 Ancestors” somewhere in the title of the post and you won’t need to leave a comment here for me to know what you’ve written for the Challenge. Thanks for including my entry. I’m only 7 weeks behind. That’s no too horrible. I look at it this way — anything you write is more than what you had before! I’ve put another post on Skeletons In The Closet called The Night Riders Of Kentucky.